Six gold, one silver and two bronze medals. That is the number of medals students of the University of the Free State won at the 2013 Nedbank National Championships for the Physically Disabled, held in Pretoria. 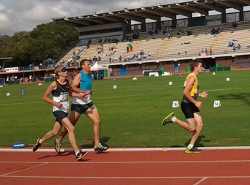 Louzanne Coetzee, Danie Breitenbach, Juanré Jenkinson and Diederich Kleynhans held the Kovsie flag high, winning medals in track and field events. Louzanne and Danie, both visually-impaired students, each won three gold medals, with Danie setting two new South African track records. Danie, who took part in the T11/F11 sports class for visually-impaired, totally blind athletes, set records in the 800 and 1 500 metre track events. This first-year BA student, who runs with a guide and has to wear a blindfold when running, also won a gold medal in the 400-metre track event. Louzanne also took part in the T11/F11 sports class and won gold medals in the 800-, 1 500- and 5 000-metre events. With her winning time of 2 minutes and 53,8 seconds in the 800 metres, Louzanne, a second-year BA Corporate and Marketing Communication student, reached the qualifying standard for international participation. She may be considered for a national team that will compete internationally. Diederich and Juanré took part in the F37 and F38 sports class for physically-impaired athletes and won medals in the field events. Juanré, a fourth-year Education student, and Diederich, a master’s degree Theology student, won bronze and silver medals in shotput. Diederich also won a bronze medal in discus. Also taking part in the national championships, were Sidwell Monyane, a final-year B Public Management (Human Resource Management) student. Sidwell was part of the Free State Boccia team. Boccia is a target-ball sport for athletes with disabilities, which has a major impact on motor skills.